James Duane, founder of Duanesburg, ordered the building of Christ Episcopal Church after he had the wilderness cleared in the 1780's. 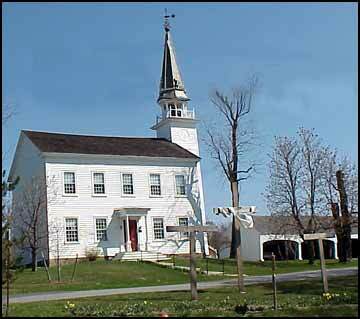 He saw the church as the center of the town square, which would be the center of the village of Duanesburg. The church remains but the village was settled to the east! The church was built in 1792-1793. Today it is authentic except for a few changes. The carriage shed now has six bays instead of seven. The east side of the bell tower was added in 1811 or 1812. The original spire was struck by lightening in July of 1878 and was completely destroyed. It was rebuilt right after that and a new bell was put in at the Centennial, 1893. Electricity and central heat were installed in the mid 1900's. The church has box pews and a high pulpit. It is believed that Christopher Wren, the designer of the famed St. Paul's Cathedral in London, England designed the high pulpit, sounding board over the pulpit, and three-part palladian window. The Duane family had its own pew, on the same level as the altar, on the opposite side of the pulpit. The organ was put in about 1847. It was electrified in the early 1970's or 1980's but can still be pumped when the power goes out. Marble tablets on the front of the church commemorate the Duane and North families. All of them are buried in a crypt, now closed off, under the church. The road where the church is located is called Duanesburg Churches Road because there were two churches at the corner of Route 20 and Duanesburg Churches Road: the Episcopal Church and the Reformed Presbyterian Church, which burned in December of 1951. It was rebuilt as a stone church in the village on Route 7.